It is often assumed that a move to organic growing involves a sacrifice. There is an expectation that yields will drop and you will fall in a financial hole for 2 or 3 years until lower input costs and higher premiums for your produce help to compensate. That may have been the case with ‘organic by neglect’ but ‘informed organics’ should never involve sacrifice. In fact, the opposite is often true as we will see in my latest grower story. I have been interstate again for the past few days delivering a one-day seminar in Coonabarabran in NSW. Glenn Walker and Sandi Middleton are our new distributors in that region and I was accommodated at their property in a wonderful, handmade mud brick house with a rustic charm that perfectly complements their earth-friendly, sustainable philosophy. When attending our seminars, many growers experience the paradigm shift where they recognise that biological agriculture is much more than a fad – it is the future! At this point they are inspired to experiment with some of these principles, but they often need some practical guidelines to make a start. Glenn and Sandi have recognised this need and, in response, they have specialised in on-farm training to demonstrate every aspect of biological farming. Glenn’s practical prowess has proved an invaluable asset during these field days and they also utilise recognised experts to demonstrate the mechanics of key biological tools. Growers get to see and experience tactics ranging from soil testing and crop monitoring to foliar application, liquid injection and microbe brewing. This hands-on pragmatism is proving a much-needed adjunct to the classroom lessons, as many growers gain the confidence they need to initiate change (when observing the system at work). 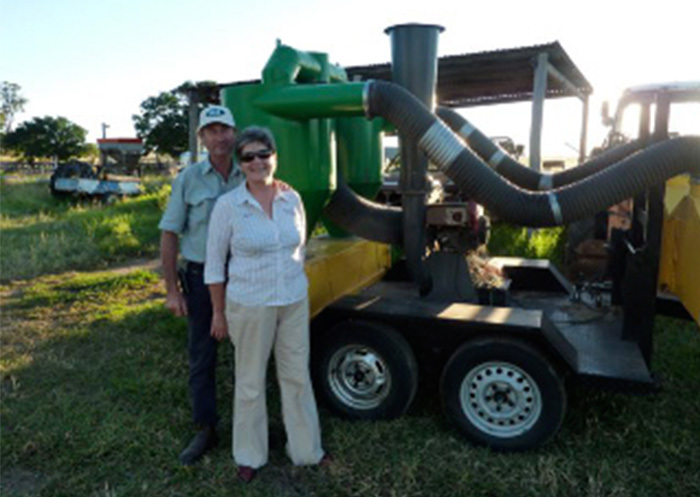 Sandi and Glen with the machine they use to harvest native grass seed. This passionate couple have also pioneered pasture cropping in the region and this productive, carbon building strategy is fully explained at their field days. They are also the second largest producers of native grass seed in NSW. It was a rare pleasure to tour their large, picturesque property while Glenn identified numerous native grass species that were in full seed and ready to harvest. I felt a personal mind shift as I came to recognize the fascinating variety of different seed heads – what had once seemed nuisance, overgrown pasture suddenly became a thing of beauty! Vic Camilleri, an accomplished grower and personal friend, attended the Coonabarabran seminar and suggested that I visit his property to check out his crop, en route back to Tamworth airport. 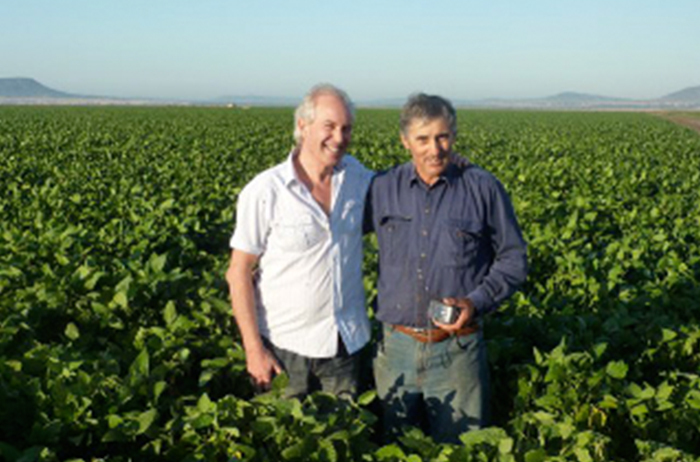 Vic Camilleri and his brother Willy farm a thousand acres of alkaline black soil on the Liverpool Plains near Gunnedah in NSW. They had originally pioneered biological cotton in their region and regularly achieved yields of 4.5 bales per acre using biological principles. These exceptional yields were achieved with just 100 units of nitrogen in comparison to chemical growers who were using at least three times that level of N to achieve anything approaching these yields. 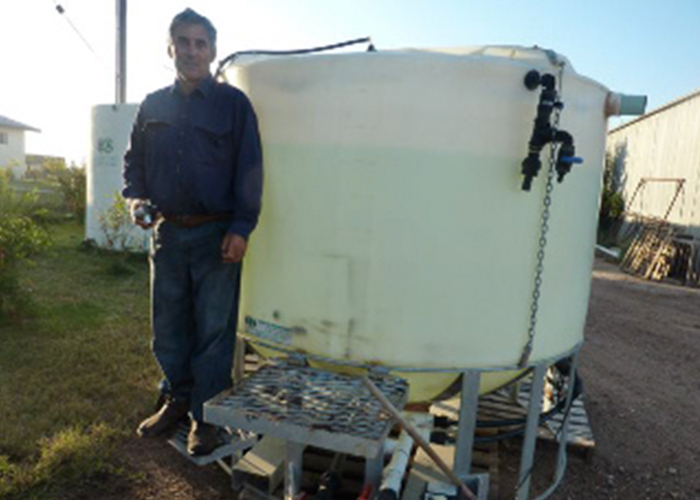 Vic achieved this by stabilising and magnifying his water-run urea with humic acid. The urea and humic acid were blended as liquids in a 50,000 litre mixing tank prior to incorporation in the flood irrigation. Vic also favours foliar fertilising and he would begin banding foliar fertilisers like Triple Ten™ on the cotton at the two-leaf stage. Three years ago they decided to take the final step in their biological journey by discarding the last of their chemical crutches and embracing organics. They researched the economics of various potential crops before deciding upon soybeans and they have now completed the “in conversion” phase and are certified organic. There are many growers, conventional and biological, who feel they are shackled to the herbicide rig, so it may be of interest to hear how the Camilleris manage weeds without chemicals. Vic admits that he considered weed management the most daunting of the many challenges he faced with the new approach. However, it also represented an opportunity to utilise his design initiative. Australian farmers are renowned for their capacity to develop innovative new problem solving tools and Vic is no exception. 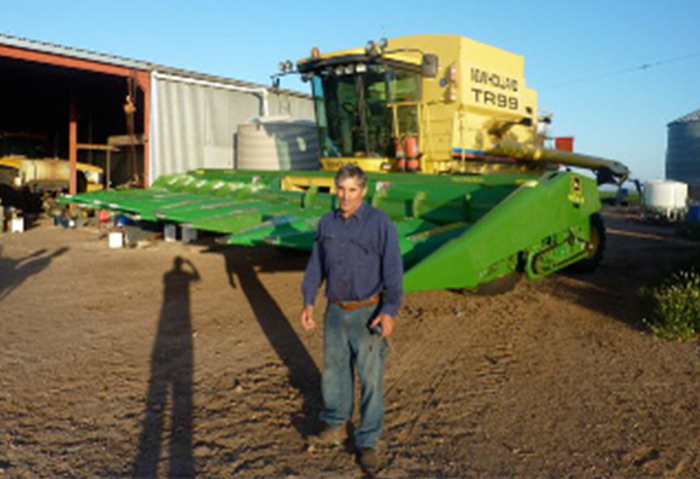 In this instance he designed a 12-metre wide rod weeder to speed up the first step in mechanical weed management. 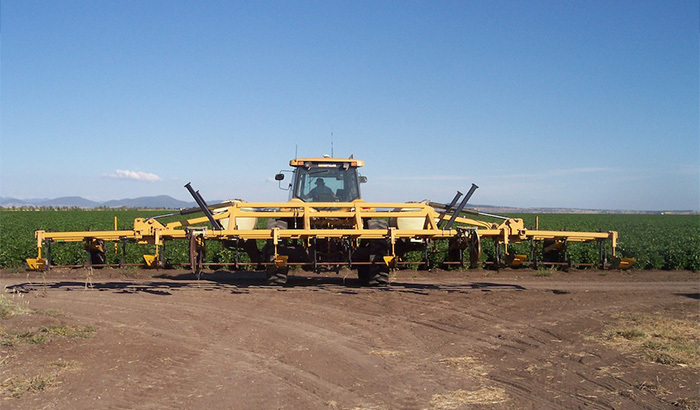 Just before planting, this hydraulic implement, which Vic proudly describes as “the best rod weeder in the country”, is used to remove weeds that may compete with the emerging crop. New seedlings emit an auxin hormone within 48 hours of germination and this helps the plant to establish a control zone where competing plants are discouraged. Mechanical weed management is about precise timing that magnifies this phenomenon. The rod weeder scuffles the soil down to about two inches while rotating counter clockwise. Vic calls it his ‘Roundup’, as he also uses this tool for general weeding. 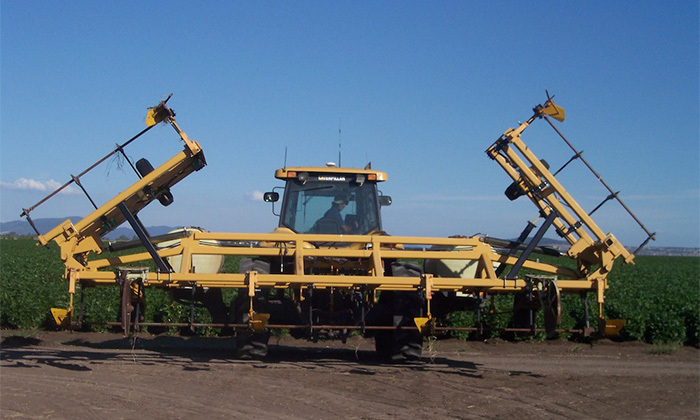 He can very effectively weed 12 – 15 hectares per hour with this device, which is slower than herbiciding but you don’t have any chemical costs. The 12-metre rod weeder designed by Vic to stir the surface and remove weeds before planting. Vic's Rod Weeder in its full glory, extended to 12 metres. After the rod weeding, the crop germinates and gets a bit of a head start before the first flush of weeds arrives. 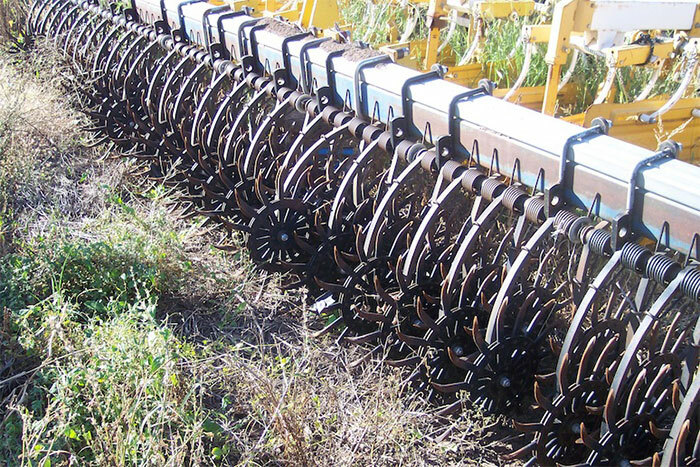 A Yetter Power Harrow is then used to successfully remove about 70% of these weeds as they germinate. The remaining 30% are removed with a standard harrow about 7 to 10 days later. The crop now has a big start and the second and third flush of weeds are attacked with inter row cultivation twice before the rows close and weeds are no longer an issue. This whole process is, of course, weather dependant, but the aim is to mechanically remove all weeds to avoid hand chipping. If the weather disrupts this game plan, then it can be more costly. Vic cites a recent example where he paid $11,000 for hand chipping on 84 hectares. However, many conventional growers would be amazed to hear that this mechanical approach is actually more cost-effective than herbicides and, even if hand chipping is needed, it is still no more costly than the chemicals. So, there you go – you need not be a slave to your spray rig. Thousands of growers are managing weeds without poisons, saving money, having more fun in their farming and sparing soil-life damage in the process. I have a great respect for these growers, as they are genuine masters of their trade. Food production involves the most important profession on the planet and those who can produce good food without chemical intervention are truly princes of their profession! Vic's Yetta rotary harrow that is used to remove 70% of the first flush of weeds. 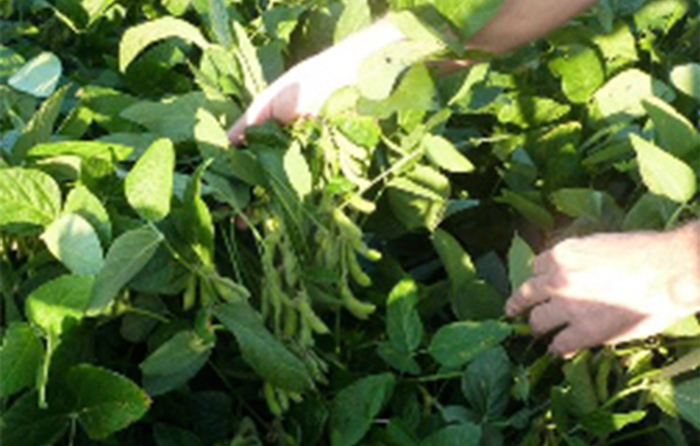 Vic’s program for the soybeans this season involved a vetch green manure crop, which was turned in with a pre-plant application of composted chicken and cow manure. NTS Soft Rock™ and basalt crusher dust was combined with the compost to create Microbially Enhanced Nutrient Delivery (the MEND effect I am so keen on). Soft Rock™ is much more effective in alkaline soils when it is combined with compost as the organic acids sponsor more rapid release of P.
20 litres of brewed Nutri-Life 4/20™ per ha – this is a highly successful microbe innoculum that includes nitrogen fixing organisms and phosphate solubilisers. 3 litres of Phos-Life™ per ha – this is liquid micronised guano that contains over 26% calcium to boost early growth. 1 kg of Zinc Sulphate per ha – to address soil shortage. 1 kg of Manganese Sulphate per ha – to address soil shortage. 200 grams of NTS Fulvic Acid Powder™ per ha – to chelate the above minerals while promoting root and shoot growth and stimulating biology. 200 grams of Nutri-Kelp™ (100% soluble seaweed powder) – to trigger germination and promote early vigour. 500 mL of Nutri-Key Shuttle Seven™ – seven chelated trace minerals for total plant nutrition. 1 L of Gyp-Life – micronised liquid gypsum. 1 L of Nutri-Sea Liquid Fish – for broad-spectrum nutrition and biostimulation. 1 L of humic acid (a DIY liquid made from NTS Soluble Humate Granules™) – for multiple benefits. Vic with his recently completed, 5000 litre microbe brewer. This is a comprehensive formulation that costs less than a granular planting blend (around $50 AUD per hectare) and yet it offers more complete nutrition for every facet of early plant growth. The young seedling responds much better to this sort of food than the typical oversupply of salt and acid provided by DAP/MAP or Urea. Foliar fertilising is 12 to 15 times more efficient than soil-based fertilisers and Vic first discovered the many benefits of entering the plant via the foliar route at least a decade ago. His philosophy is to provide complete nutrition several times during the crop cycle. He has found that low application rates are most effective particularly when mineral uptake is enhanced with humates. The first two applications are by ground rig and the second two are by plane. All four applications include the following ingredients but boron is added to the pre-flower spray and the later sprays will also focus upon any other mineral that is deficient (as revealed by regular leaf analysis). This seven-part recipe is boosted with 1 kg of soluble boron per hectare for the pre-flowering application and there is a potassium focus during seed formation and seed fill with some extra potassium sulphate and 1 litre of K-Rich – a high-analysis, organic source of complexed potassium. Leaf analysis has recently revealed a slight shortage of copper (which had not been previously included in this program), so copper sulphate was included in the last two sprays at 300 grms per hectare. How Is The Crop Faring? I was so impressed with the Camilleri’s crop. It is probably the most healthy soybean crop I have ever seen. The leaf analysis details have been exceptional and the crop has been measured at 14 degrees brix. For those of you unfamiliar with brix readings, they are a measure of dissolved solids within the plant. You are using a refractometer to monitor your management skills as a chlorophyll manager. Nutrient density, as determined by brix readings, is a direct guide to plant health, disease resistance and yield potential. It is also an excellent indicator of profitability. 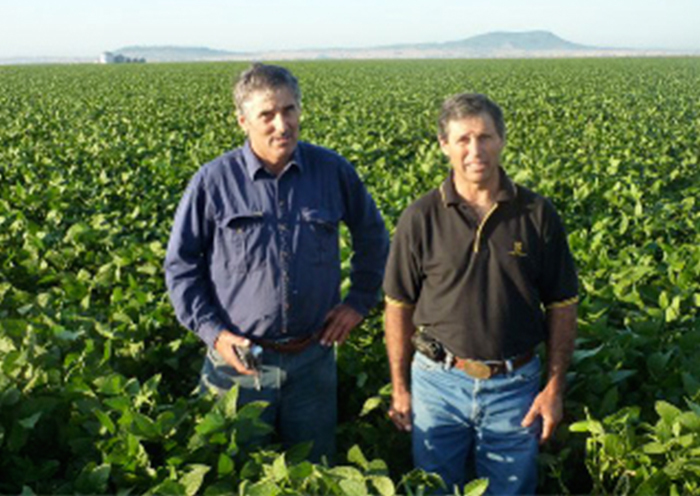 Vic estimates that a good portion of the crop (with the exception of a very late planting) will yield at 1.5 tonnes per acre and the brothers are both very satisfied at the results of their efforts. However they are also well aware of the vagaries of Nature. The crop is insured for hail but an early frost could prove disastrous. We discussed their protective options and I will share some of those suggestions here. Vic and I in a sea of superbly healthy soybeans. Impressive clusters of beans hang from every plant, contributing to an impressive, estimated yield of 1.5 tonnes per acre. An early frost before the pods have completely filled would decimate this crop but there are some options that could be considered. It is fascinating how all encompassing the biological story can become. Who would have thought, for example, that organisms on the leaf surface could influence success or depressing failure in the face of an unseasonal frost event. It is now known that organisms called Ice Nucleating Bacteria are responsible for the formation of ice crystals during a frost event. It has been found that a beneficial bacterium called Pseudomonas florescens devours this creature and can minimize frost damage. NTS markets an inoculum based upon this Pseudomonas species and it was trialed last season in South Australia. Our South Australian distributor, John Norton from Biotech Organics, reports some amazing results using this protective strategy. In one case an Avocado grower reported no damage, despite temperatures dropping to 18 degrees below zero and grape growers were similarly impressed. The best anti-frost strategy would involve a combination of the three inputs that have been linked to frost protection. These include Nutri-Kelp™ soluble seaweed powder, buffered potassium and Pseudomonas florescens. This combination should prove even more effective if it is combined with Cloak™ Spray Oil. This oil sticks the ingredients to the leaf while providing a protective bio film for the beneficial bacteria and it also provides a food source for these creatures. Here is a recipe suggestion. This will need to be flown on with around 50 litres per hectare. These aerial applications cost Vic around $6000 AUD for the cost of spraying the whole area. However this is a minor cost if it offers frost protection. The Camilleri brothers have confronted a new challenge and, in the process, have proven that organics need never involve a yield sacrifice or loss of profit. Organic growers are permitted to use the same minerals used by conventional growers but they are often in a different form. If you want to boost P rapidly in alkaline soils but are not allowed to use DAP/MAP then mix your Soft Rock Phosphate with manure or compost and use those organic acids to fast-track P release. If you need a nitrogen boost, learn to mine your nitrogen from the atmosphere. 74,000 tonnes of nitrogen gas hovers above every hectare and this was where we were supposed to source the lion’s share of our N. To access this free gift you need small amounts of molybdenum, cobalt and soluble iron and this is why Vic included Shuttle Seven™ in his liquid inject and foliar programs. No young plant needs a load of acid/salt fertilisers under its roots and Vic has shown that a nutrient-packed liquid injection at planting, supported by a timely, well informed foliar regime, is a more productive approach. However there are other appeals to adopting a different approach, as Vic explains, “Everyone told me I would go broke trying to grow organically but that is certainly not the case. Growers need to wake up to the fact that they have been sold down the road. They have been conditioned to think that technology will solve their problems when in actual fact it often causes more problems. I proved that I could grow high yields of cotton biologically and now we are getting great yields with the beans. Don’t believe the crap! It’s not just that you can grow equal yields of better quality crops without the GM or chemicals, it is how you feel when you do it! It is so much fun to work with nature instead of against her. You feel a real pride when you grow a good crop using your growing skills and no chemicals. Farming becomes a real pleasure”.